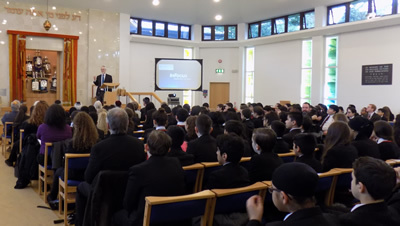 On 15 January 2018, 180 Year 8 students from Canons High School visited Edgware & Hendon Reform Synagogue to participate in an educational programme on the Holocaust. For many, it was the first time that they had set foot inside a synagogue. The Mayor and Mayoress of Barnet, Dr Matthew Offord MP, and Alderman Richard Romain were among the distinguished guests who were in attendance and they were welcomed by Rabbi Smith along with Rabbi Emily Jurman. The event was led by EHRS’ Youth and Education departments. There were also over 40 volunteers from the community who made the day memorable for their younger visitors and were on hand to answer questions and assist with a workshop based on Irene Sendler, a Catholic social worker in the Warsaw Ghetto, who saved some 2500 Jewish children during the war. Eva Clarke was also in attendance. Eva was born in Mauthausen concentration camp, Austria, on 29 April 1945. Eva shared her story about her life with an attentive and intrigued audience, answering questions when her story had been told. She has dedicated her life to sharing her remarkable story. At the end of the afternoon six memorial candles were lit for the six million Jews who died in the Holocaust, and a seventh candle was lit to remember subsequent world genocides. EHRS educators and youth workers, together with many of the volunteers have attended training provided by Edgware & Hendon Reform Synagogue, and Finchley Reform Synagogue.